The Betson multisync has arrived! And it's every bit as good as I was hoping it would be. I've just posted a "first impressions page" with some photos, and I've got to say I've found nothing so far that would keep this monitor from being the WG-D9200 replacement that I was looking for. Stay tuned, as I'm going to be doing more testing over the week and will update the first impressions page with my thoughts as testing progresses. This is either incredibly cool or a lawsuit just waiting to happen: Behold the Furminator, an 'immersive' first-person pinball machine. By immersive, I mean you stick your head in it. By first-person, I mean your face is right behind the flippers! This is no VR-simulation — it's an actual pinball machine! Check out the furminator photo gallery for lots of pics, including shots of the players faces when their heads are inside the machine! 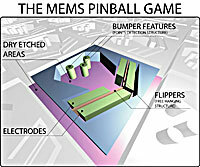 The game is a modified Terminator 2 pinball machine, complete with additional video monitors and adjusted lighting displays. I don't see any "blast shield" to protect your face from air balls, but at least they're wearing a helmet! The Real Ultimate Lunar Lander Game! James McGovern pointed out to me that I had missed a second very cool 3D lunar lander simulator, complete with an AGC computer like the link I posted yesterday! They've even got full re-creations of many of the actual Apollo moon landings. Check out Eagle Lander 3D for everything you need to visit the moon. There's even a cool movie showing the simulator in action. Okay, the video companion to the review of the Treyonics Centurion posted yesterday is now online and available for viewing over on the RetroBlast Video Reviews page. You know, if a picture's worth a thousand words, what's a video worth? No, not the video game — an emulation of the actual AGC (Apollo Guidance Computer) used in both the Apollo missions' command module and lander module! Now you, too, can simulate trying to reprogram the AGC so you can save your own crippled Apollo 13 mission! The RetroBlast review of the Treyonics Centurion arcade controller is now available over on the Reviews page. I am honestly impressed at the improvements Treyonics has made in their arcade controllers. So, what's new? Check out the review and find out! Raffle Funds Pushes Donation Total over $10,000! Just noticed that the total donations for the MAMEworld ROM dumping fund have now broken the $10,000 mark after the $450 donation from the RetroBlast raffle! Thanks to everyone who entered the raffle! Thanks to Jeremy Schwab for pointing out that refurbished ACT-Labs Lights guns are available at the ACT-Labs web site for $29.99, and that the TV version of the light gun is still available for sale. What does it mean? Got me, but we can hope that the Home Arcade series mentioned has something to do with light guns! Thought I would let you know that the new ATI 9200 Chipset in the ArcadeVGA card gives a clearer picture (at least on my monitor anyway) and best of all plays video with h/w acceleration enabled. This means that not only can you play MAME but Daphne laser games perfectly. ACT-Labs PC USB Light Gun Discontinued! In a truly shocking discovery, Sam Kolbe wrote me to let me know that ACT-Labs has discontinued their PC USB Light Gun! Sure enough, I tried to place an order for one and got a "discontinued" notice. Q: Is there a replacement gun in the works? A: At this time no but we hope that will change within 2 months. So there's some hope, but this is not good news for arcade shooter fans, especially since the long-awaited EOps Motion Gun still hasn't been released. Asteroids Deluxe on a Chip? Yup, and how about a VIC-20 on a chip as well? Lots more cool stuff over at the FPGA Arcade, a site dedicated to hardware reproductions of classic arcade games. Thanks to programmable FPGA (Field Programmable Gate Array) chips, old arcade machines can be emulated in hardware rather than software. Think of it as MAME in pure, unadulterated silicon! They've got some fascinating projects, and I'm very impressed with what they've managed to accomplish. Thanks to Jim Krych of Treyonics for pointing out their site! Jim Krych of Treyonics dropped by today to show off their latest and greatest control panel, the Centurion. It's got some great new features, including a new custom spinner, OmniStik Prodigy 4/8-way joystick and a Suzo-based top-fire joystick (that I liked much more than the Happs top-fire!) — look for the full review soon! It looks like GroovyGameGear has updated their product lineup, and their revamped online store has got a lot of neat items for your MAME cab. One of the more intriguing was the new "Retro" edition Prodigy joystick, with a steel shaft and switchable balltops. Cool stuff! In researching the Warp Speed game that may or may not be the prototype of the classic Star Wars arcade game, James McGovern came across the web site of Jed Margolin, one of the programmers of Star Wars. Jed's got a fascinating collection of patent documents and other ideas, but what caught my eye were the minutes from a development meeting at Atari in February of 1983. If you ever wanted an insight into how games get created, this is where to look. Very cool stuff for an arcade game enthusiast! It looks like the arcade prototype Warp Speed has possibly been found. Warp Speed was an arcade game in development that was transmogrified into the classic arcade game Star Wars before it ever saw an arcade. Check out the full message thread on rec.games.video.arcade.collecting for all the details and history of this unique one-of-a-kind arcade gaming find, if it's the original game. Now this is something interesting — TLC Industries has just announced a new online gaming service that will be based on real arcade controllers, including arcade cabinets! NEXT Arcade is a subscription service that will feature tournaments and other online gaming community features. Plus, check out the picture of a very intriguing expandable control panel! Details are still a bit sketchy, but it looks promising: check out the press release. An interesting article in the Monterey Herald about the Classic Gaming Expo held this last weekend in San Jose, California. Yes, they are cranking them out. No, I don't know what all has changed. Yes, you can download it at www.mame.net. I just received my arcadeworx from HanaHo. Shipping from California to Washington state took 3 days by DHL. Everything was packed with form-fitted foam in two large, strong heavy boxes, as you can see from the attached pics. Every part had a peel off label with the part number on it and some type of orientation instructions. The kit is assembled with large wood screws, but the pilot holes are just right, and even with my manual screw driver it went together quickly without making my wrists sore. The kit also includes the correct #3 philips bit for power or ratcheting screw drivers. Once assembled it is very solid and sturdy. The top half is connected to the bottom with six good sized carriage bolts. With the exception of the inside edge of the monitor bezel, all edges are finished or have black T-molding on them. The included artwork is printed on self-adhesive vinyl, and must be trimmed to fit. It is much larger than needed so there is ample room to correct trimming mistakes. I have yet to install my control paned as I wish to use my Hotrod on my desk until I am ready to put the guts in the cab. Also, despite what the pic shows, the included flouresent lamp does provide nice, even illumination. A new pinball review today, specifically of the great pinball plastic protector sets from Orbit Pinball. These lexan protectors can help to shield your hard-to-replace pinball plastics from the inevitable flying pinball, and they even add a cool stylin' look to your machine. Check out the review for full details. Okay, I finally got a total price from Betson for the monitor, and after taking into account fees, shipping, and everything else from the contest, I have $450 left to donate to the MAMEworld Board Dumping Project. Wouldn't you know it? MAMEworld just posted a request for more donations, since they need $300 for some rare boards — looks like a job for RetroBlast! Perfect timing. The Betson montior is going out today, due for delivery sometime on Tuesday or Wednesday. I'll be sure and post some "first look" pictures and my first impressions. I'm still working on implementing a new RSS-compatible news system, but it's not looking good. I've been trying B2Evolution, but it's so slow I really don't feel it's going to be usable. I suspect the problem's with my host system for the MySQL database, but who knows. If you've got any suggestions on a good news/RSS system, please let me know. John's book has attracted 2 new members to BYOAC who are posting projects (one is on the second cabinet). Now, of course he has attracted more than two, why are these two so special? No, really. Women building arcade cabinets, cats and dogs playing together, TOTAL CHAOS! One is actually in a dispute with her husband as she wants to have two cabs, a driving and an upright, going at the same time and he won't let her! I've finally spoken to a sales rep at H Betty Industries (Betson), and will most likely be ordering one of their Kortek multisync arcade monitors by the end of the day. We had a very interesting conversation, and he mentioned that the monitor I will be reviewing is the same one used in the new "Target: Terror" arcade game, recently released by Eugene Jarvis' company. Raw Thrills. Big Warning: May contain offensive material! Over at Something Awful is a collection of "proposed" video games that should never, ever be made! Joystick of the Week Returns! Yes, after a long absence (sorry about that!) I've got the next installment in the joystick of the week reviews: the Happ Controls Rotary joystick, just the thing for games such as Ikari Warriors. So, how does the Happs Rotary hold up in normal gameplay? Check out the review. I'm still trying to work on implementing a new "blogging-style" news page, complete with RSS feeds. It's taking longer than I expected (mainly because I've been so short of free time the last three weeks! ), but I hope to make some progress. In the meantime, I've expanded the Retrogaming Newsfeeds section of the news page with some new feeds. It looks authentic, and if you're a die-hard console retrogamer, this looks to be just the ticket to play Pitfall in all it's glory. Thanks to James McGovern for the news! RetroBlast reader Shawn Stephens pointed out to me that Ultimarc's ArcadeVGA is now listed on the web site as using the ATI 9200 chipset (not the ATI 7200 chipset used originally). I'm checking into this, but if it's for real it should mean an improvement in 3D acceleration for MAME cabs using the AVGA card. Need to locate a video game? Here's a neat new service from MoonPod Games: an Arcade Machine Locator, which allows you to locate a favorite game near you. It's new, so be sure and contribute what you know — the more people who add to the database, the greater a resource it will be! Now this is cool. Science meets gaming in an ultra-miniature pinball game, complete with working flippers and an extremely tiny ball. And there's even video of the thing in action as well! At last! News and a review on RetroBlast (sorry about that, folks!) We start off with a review of Lucky Wander Boy, a novel by D.B. Weiss. What's retrogaming-related? How about the fact that the novel revolves around a man's discovery of MAME and his quest for a favorite video game, the fictional "Lucky Wander Boy". Check out the review by RetroBlast's contributing reviewer James McGovern. My usual list of patches have been updated and now support a new patch that will give some black and white vector games a nice bluish tint. I found that Asteroids Deluxe had this bluish tint enabled for it, but Asteroids did not. This new patch gives the bluish tint to a bunch of black and white vector games that were just plain white before. A new option has NOT been implemented for this, because you can disable it by using the -noartwork option. My disclaimer is that I don't know if the games I added the bluish tint to actually had a bluish plexi on the actual arcade game or not. I just really dislike the white on black look, and I find the bluish tint more authentic looking. Sorry for updates being so slow on the site lately — I've got relatives visiting, swimming lessons for the kids, and life in general has been hectic all of a sudden. Lots of changes, most of them internal, but it looks to be a significant upgrade. As always, it's available at mame.net. He had the metal control panels produced at ArcadeDepot. Congrats on a great cab, Sal! If you can't get enough fresh MAME news, here's a fix for your news-junkie needs: a MAME RSS screensaver, compliments of Sal Campana, that grabs the MAMEworld RSS newsfeed and delivers updated news stories throughout the day. You can scroll through the list using the arrow keys and press the space bar to auto-launch your browser. Note: This screensaver requires the .NET Framework 2.0 or higher, which can be downloaded from Microsoft's web site. It's a 24mb download, but it's worth it for this screensaver. This problem involved some of the Perfect 360 joysticks sold from mid-September 2003 until about March 12. Since then, the problem has been fixed. James Kyrch over at Treyonics just sent me details of their upcoming Centurion controller, and it looks great. They're using the OmniStik Prodigy 4/8 way switchable joystick as their player one stick, and have a matching top-fire for the player 2 position. It's got an improved spinner, mouse and pinball buttons, and more. It's a very nice design. I recently ordered two P360s for my stand alone MAME controller (still looking for the perfect Robotron sticks) and I was dismayed once I installed them as I simply could not hit many of the diagonals despite massive amounts of force applied to the stick. I sort of figured the problem was the stiff springs married to a fairly light weight controller, but I recently learned that numerous other people have been having the same problems. It turns out that Happ had a bunch of P360s with an incorrect resistor on the optic board which created this problem. I have seen that Happ is replacing the faulty sticks, so people that are having problems should contact Happ Controls. A while back I posted about a unique looking tiered control panel, one that had controls on two levels so that they didn't interfere with each other. Now, thanks to an email from Jeff Allen, I now know where this great design originated: Jeff's excellent Supercade cab. He's even got a guide to building one yourself, so be sure to check it out! The Betson Imperial Multisync looks to be the same monitor as the Kortek KT-2914, and it looks to have even better specs than the D9200. I'm going to use some of the raffle funds to purchase one for a review as soon as I get some price quotes back.